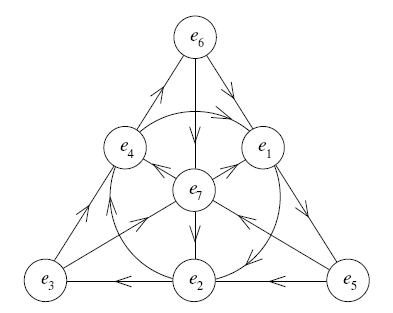 Part 1: integral octonions and the Coxeter group E10. Also available on the n-Category Café. Part 2 - the integral octonions, 11d supergravity, and cosmological billiards. Also available on the n-Category Café. Part 3 - the 240 smallest integer octonions, also known as the E8 root polytope, and their connection to exceptional objects in mathematics. Also available on the n-Category Café. Part 4 - faces of the E8 root polytope. Also available on the n-Category Café. Part 5 - Dynkin diagrams and the geometry of the E8 root polytope. Also available on the n-Category Café. Part 6 - How to multiply octonions, and the Cayley integral octonions. Also available on the n-Category Café. Part 7 - Greg Egan's proof that 2 × 2 self-adjoint matrices with integral octonion entries form a copy of the E10 lattice. Also available on the n-Category Café. Part 8 - My proof that 3 × 3 self-adjoint matrices with integral octonion entries contain a copy of K27 lattice. Also available on the n-Category Café. Part 9 - Greg Egan's construction of the Leech lattice from the E8 lattice. Also available on the n-Category Café. Part 10 - Fitting the Leech lattice into the exceptional Jordan algebra. Joint with Greg Egan. Also available on the n-Category Café. Part 11 - How to find 270 rescaled copies of the first shell of the E8 lattice sitting in the second shell, and what you can do with these. Joint with Greg Egan. Also available on the n-Category Café. Part 12 - Tim Silverman on the integral octonions mod 2. Also available on the n-Category Café.